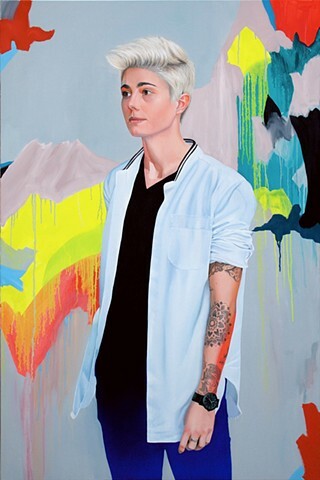 Finalist entry in Archibald Prize, Art Gallery of NSW, Australia. Michelle Heyman is an openly gay athlete who proudly represented Australia at the Rio Olympics in 2016. I approached Michelle about a portrait after we’d both appeared on the LOTL Powerlist and Cosmo Rainbow List, each of which celebrated the most influential and inspiring LGBTQI+ and allied Australians. As a striker for the Matildas and Canberra United, Michelle is one of Australia’s most impressive sportswomen. She is passionate about being a role model for kids and openly speaks out against bullying, encouraging young people to be their authentic selves.